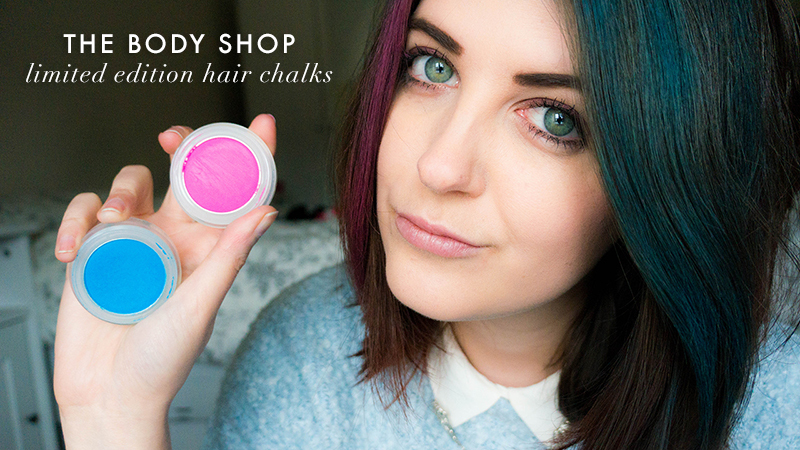 When The Body Shop Hair Chalk press release landed in my inbox, I had to say that I was intrigued. Limited edition temporary hair colour that shows up on a brunette? I was sold as soon as I saw the pictures. If you are a brunette, you'll know just how difficult it is to get any temporary hair colour to look half as vibrant as our blonde haired ladies. Touted as the perfect way to brighten up your hair without permanent colour commitment, The Body Shop have got this Spring beauty trend on point. Turning up to a design pitch with shocking blue hair isn't a good look, so I can choose to party it up at the weekend but come Monday morning, my colleagues would be none the wiser. 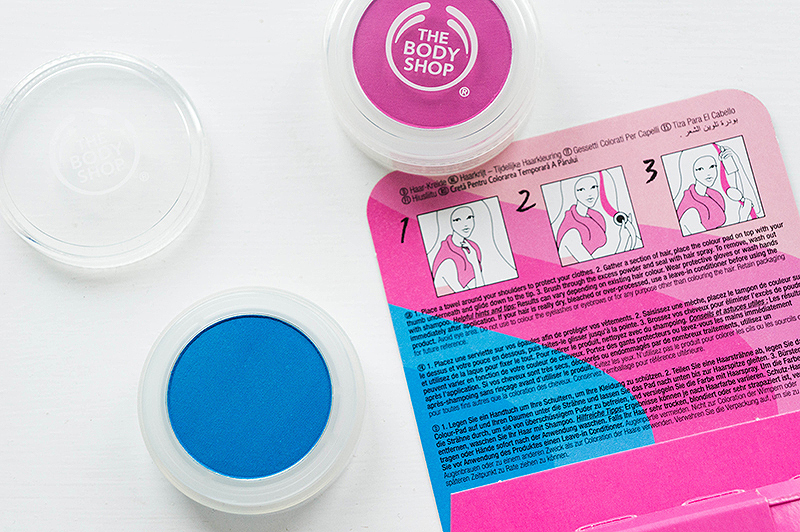 The hair chalks come in two colours: Tickle Me Pink (gorgeous on blondes) and Falling For Blue (shows up amazingly well on brunette hair). I can see these making a big appearance in most makeup bags as soon as we get a hint of sun, the perfect pick me up to tiresome hair when you just can't decide whether to cut or colour. All you need is a towel to cover your clothes in case of fallout, a brush and some hairspray. Gather a section of hair, place the colour pad on top and you can either use your thumb or a cotton pad underneath and glide down to the tip. Brush out to even out the colour, seal with hairspray and it'll last all day until washed out. The pans of colour are easy to hold, and means you spend a little more time concentrating on a small section of hair. I found it so easy to work with, and was impressed with the results. Any all out is easily caught if you use a towel, just remember to wash your hands afterwards or fear being mistaken for the Cookie Monster! At only £5 a colour pad, these aren't going to break the bank. I'm hoping The Body Shop release a few more of these in other vibrant colours as I'm definitely feeling like a pop of lilac through the ends could be just the answer to my lack of BLEACH products. 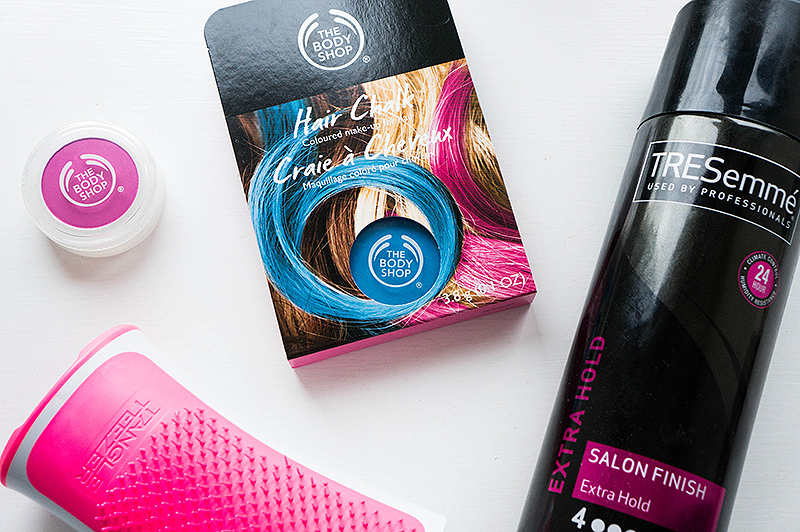 Have you tried hair chalk? What do you think of the pink and blue? Want to advertise with me in March? Look to the advertiser page.